Days of tribute to the late U.S. Senator John McCain began Wednesday, his body lying in state under a flag-draped coffin in Phoenix, the capitol of his home state of Arizona. His widow, Cindy McCain, gently touched his casket and knelt silently to rest her cheek against the U.S. flag before other family members and mourners walked by to pay their respects on what would have been the lawmaker and war hero's 82nd birthday. McCain's sons were in their military uniforms and his daughter, Meghan McCain, wept as the tribute unfolded. 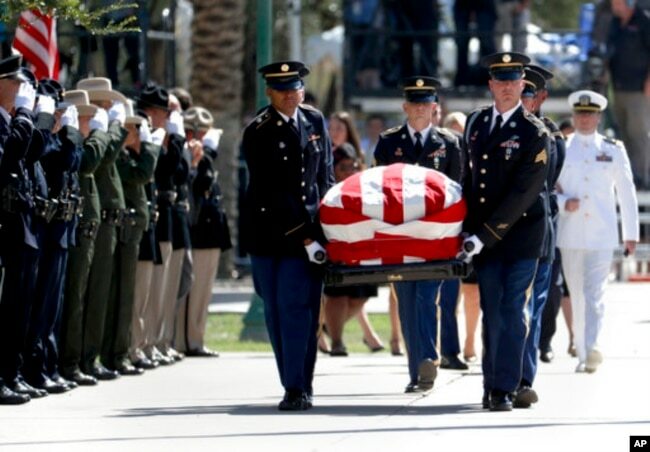 The Arizona National Guard carries the casket of Sen. John McCain, R-Ariz. during memorial service at the Arizona Capitol in Phoenix, Aug. 29, 2018. In a brief eulogy, Arizona Governor Doug Ducey described McCain as one of the few politicians who could get other lawmakers to set aside their differences in the interest of compromise. He said life in the state without McCain would be like imagining Arizona without its world-famous landmark, the Grand Canyon. Later, the public began filing past the casket bearing the remains of the man who represented the state in Congress for more than three decades, a political life that led to his unsuccessful 2008 run for the presidency as the Republican party nominee. Decades before, McCain first drew the attention of Americans as a naval aviator who was shot down in a bombing run over Hanoi at the height of the Vietnam War and held by his North Vietnamese captors for 5 1/2 years as a prisoner of war. U.S. 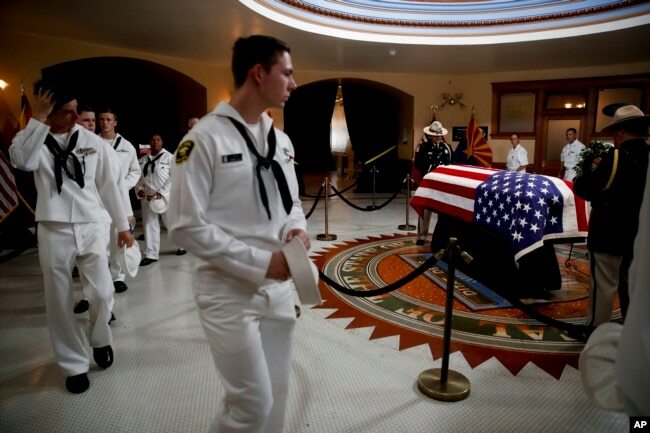 Naval sea cadets walk past the casket to pay their respects to Sen. John McCain, R-Ariz. at the Arizona Capitol in Phoenix, Aug. 29, 2018. After a memorial service Thursday in Phoenix, McCain's body will be flown to Washington, where he will lie in state Friday in the Capitol Rotunda after another ceremony remembering his life and government service. The remembrances continue Saturday at Washington's National Cathedral, where speakers will include former Presidents Barack Obama and George W. Bush. McCain is to be buried Sunday at his college alma mater, the U.S. Naval Academy in Annapolis, Maryland. He died last Saturday after a lengthy battle with brain cancer.